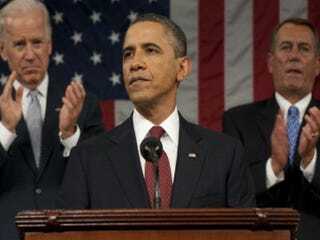 Following up on President Barack Obama's State of the Union Address, Dr. Boyce Watkins writes at News One that he agrees with the president that tackling economic disparities is a matter of national security. America, he argues, has become a nation of profligate consumers who do not care for their fellow man. … The challenge to America’s festering economic inequality problem is, quite simply, a matter of national security. Tax laws must be changed to allow the rich to pay their fair share. Our nation’s newfound belief that “greed is good” should be replaced with a concern for the well-being of our fellow man. The millionaires and billionaires who’ve somehow been led to believe that buying gas for your private jet is more important than feeding starving children must be forced to see their value systems for what they’ve become: our society has, quite frankly, become a sick place to live. One can only imagine what kind of battles the president is going to face in the coming year. Republicans are determined to be counter productive and obstructionist. They don’t like taking orders from black people, and they’ve convinced a few Bible-thumping hypocrites to support them in their desire to protect the rich. But at the end of the day, the American people must support the president’s quest to put a real discussion of economic inequality on the table, for we are fighting for the soul and survival of our nation. Read Dr. Boyce Watkins' entire blog entry at News One.